Seven miles from St John’s, approx. 30 minutes from the airport. 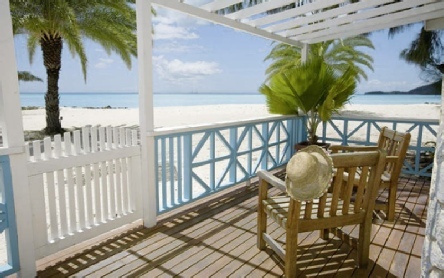 464 simply furnished, ocean-facing rooms, all with air-conditioning, shower, television and a balcony or terrace. Supersaver Rooms are small with a double bed, ideal for couples/single occupancy only. Standard Rooms are slightly larger. Superior Rooms are more spacious with two queen beds, bath, shower, mini-fridge and coffee maker. King Superior Rooms with king bed also have a small lounge area and larger balcony or patio. Junior Suites are as King Superior but have shower only and additional living area. One and Two Bedroom Cottages are beachfront in a quiet location with flat-screen television, coffee maker and mini-fridge. There are two swimming pools – one a fantasy pool with waterfall and swim-up bar – and little ones will love the fun-packed kids' club, while teens can hang out at their own club too. Active guests can play beach volleyball, netball, basketball and table tennis or take an exercise class. Non-motorised watersports including hobie-cat sailing and windsurfing are also included and tuition is complimentary. For an extra cost, you can indulge at the wellness centre's spa and beauty salon or play golf and scuba dive nearby, and hire tennis equipment and instruction. Dine in five brilliant restaurants (three of which are à la carte and only open for dinner) including an Italian and an Indian, nibble on afternoon tea and sip cocktails in one of five bars. Daily entertainment includes live bands, cultural shows, karaoke and The Casino at Jolly Beach which offers slot machines, a roulette table, two blackjack tables, and a Caribbean Stud Poker table. A fun-packed all inclusive resort perfect for families. 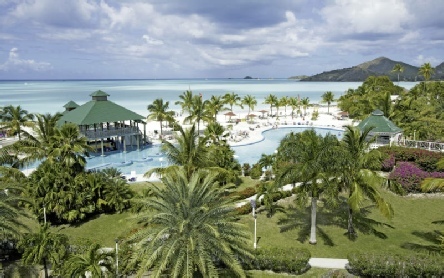 An excellent, great value all inclusive resort with ocean-facing rooms and a wide range of facilities that includes a fabulous fantasy pool, as well as a lovely location by one of the best white sand beaches in Antigua! 2019 package holidays to the Jolly Beach Resort & Spa, Antigua Prices are per person based on two sharing.